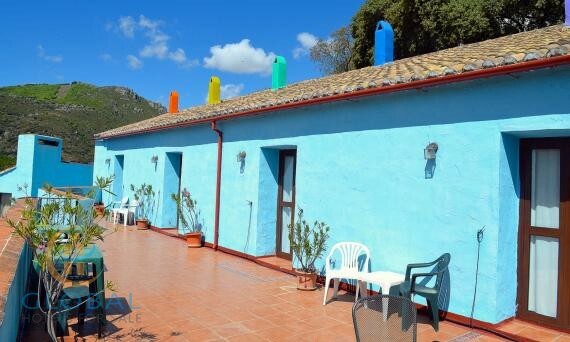 This lovely bed and breakfast is set in a large garden with orange trees and impressive views at the edge of a busy town. They have a excellent client base build up. Several bars and restaurants can be found 500 m from the bed and Breakfast. You can reach the beaches of the Costa del Sol within a 15 -minute drive and there are several golf courses within a 20-minute drive. Malaga Airport is around 2o km. This BB is a fully Licensed Business and recently upgraded. It has a Luxury Pool Area and there is a bar and a terrace, as well as a shared lounge and a games room. 1) Located on the ground floor with an en- suite bathroom with a walk-in shower. It has a patio area that faces the swimming pool offering lovely views of the garden. 2) Located also on the ground floor with a rustic fireplace and its own terrace. The bedroom offers a lovely view of the garden and the valley. 3) A room has a Moorish feel, with a large outdoor patio with a large Andalucían style table and seating area. 4) A cool water themed room, located on the first floor and offers stunning views of the valley. With an indoor seating area and a large patio as front terrace. 5) The largest room and is ideal for families. This room is detached double room on the ground floor with a sofa bed which can accommodate a further 2 guests. The room also benefits from a living area. Outside is a large patio area with sun loungers and seating. The room also has direct access to a private rooftop with stunning views of the valley. 6) Located on the first floor, with 2 outdoor areas; a terrace and a balcony. This room could also be a family as there is room for a child's bed. Further this is a winter breakfast room, a charming room with loads of original features with access to the guest library. The kitchen is accessed from the dining room. The Owner Accommodation at this property is particularly good. The apartment sits on the top floor of the main house with open plan dining & lounge and open fire. This room has high ceilings and feels light and airy. There are 3 bedrooms, one is currently used as a private office for the owners. The owners also have the use of private entrance with lovely elevated views.